Belt said she is aware of the health dangers to her caused by the dust and debris coming from the demolition of nearby houses, then there’s the noise of construction and the long-term and irreversible effects of lead paint exposure on residents. Belt and residents fighting against gentrification and potential health problems are intent on reducing the forced move and lowering the stress that comes with sudden change, including noise, dust and adjusting to a new cultural environment. The resulting health implications for his wife and son alarmed longtime DC resident Leon Lightfoot. Lightfoot, a 55-year-old truck driver, husband and father of a son who is a Howard University student, said it makes him very angry when he contemplates how he and others have been treated. Despite the buildings being renovated in 2011-2012, tenants described ​being exposed​​to lead ​(which appeared during renovations); rodent infestation; damage to the units because of water leaking ​into apartments ​through the walls and ceilings; homes overrun with mold; and residents coming down with a variety of illnesses caused by lead, mold and contamination from bio-toxins and other chemical agents. Lightfoot said he and fellow tenants have sought solutions to their myriad problems through advocacy, putting pressure on ​DC ​Mayor Muriel Bowser and other public officials by​​showing ​​​up in their offices, flooding city council meetings and putting the issues they’re dealing with ​directly in front of these officials. ​​Meanwhile, the tenants association, in an effort to seek redress, filed a $5 million lawsuit ​​in DC Superior Court earlier this year. The tenants are seeking financial compensation for the disruption to their lives and possible health impacts. In the District of Columbia, a shortage of affordable housing, a hyper-expensive rental market and aging and vanishing housing stock ​has​​have​tenants battling spiraling rents and housing costs, and​have left them at​​increased risk of ​getting​​​displaced. In 2017, according the US Census Bureau, the median household income of white residents, who make up 36 percent of the ​District’s population​​, rose $2,568 to $127,369​,​while the median income of black residents, ​who make up​​​or​​​​46 percent, fell $3,631,​to $37,891. 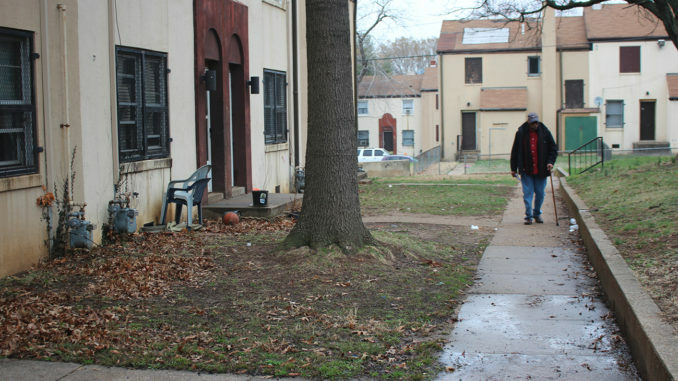 Meanwhile, 46 percent of​​these black​​residents in the Washington Metropolitan Area spent more than 30 percent of their incomes on housing costs. Those middle- and lower-income residents left in Washington, DC have limited options to move or relocate, and little money left to take care of​​​​food, medicine, utilities, transportation and other needs. Some DC government programs do offer solutions and buffer residents from the health-related ill-effects of gentrification. However, it’s sometimes hard to make a direct link between gentrification and disparate health effects, and housing advocates, members of the medical community and other experts understand that if work is done to stabilize neighborhoods and larger communities, residents — and tenants, by extension — will be healthier. It’s only in recent years that researchers, physicians, pediatricians, academics and others have begun to drill down to ascertain what, ​if any, ​health​effects might befall displaced residents as a result of ​gentrification​. These studies have been able to move anecdotal information into empirical data and quantify the potential health impacts of gentrification. A recent New York study, for example, illustrates the link between gentrification and mental health. The study​had found that hospitalization rates for mental illness – including schizophrenia and mood disorders – are two times as high in displaced persons​​versus those who remain in their neighborhood. This is one of the first US studies to quantify the hidden mental health consequences of gentrification. Housing advocates, policy makers and those in search of solutions understand that they have to go beyond treating symptoms, like asthma, high blood pressure and diabetes and get a handle on the very process of controlling gentrification. In Oakland, California, housing rights advocates and residents have been ​protesting, engaging in civil disobedience ​and​​​trying​​to get city and county officials to listen and enact policies designed to stem and change the effects of gentrification on low-income, middle-class and long-time residents. They are driven by studies that have revealed any number of negative health-related consequences among vulnerable populations wrought by gentrification, including a higher incidence of asthma, diabetes, ​and​​cardiovascular disease ​and​​shorter life expectancy; higher cancer rates; more birth defects; and greater instances of infant mortality. A 2014 report, produced by the Alameda Public Health Department and Just Cause (Causa ​Justa, CJJC) which provides free tenant counseling and case management for low-income residents of Oakland and San Francisco – focused on gentrification in ​Oakland, California. It​​was in response to a growing concern and a recognition of the connections between deepening health problems and disparities in health among children in Oakland and the conditions created by dilapidated housing, especially given the Bay Area’s high rents and extreme housing shortage. Community organizers, non-profits and residents have used advocacy, political pressure and civil disobedience to bring public officials to first understand and then be willing to act on political and policy solutions to the deleterious effects of gentrification. The report offers solutions, which, though not specifically health-related, are designed to lessen or eliminate the health impacts of gentrification. These include: developing a proactive or healthy housing inspection program; tenant protections to counter dramatic increases in housing costs, lowering the risk of instability, eviction and harassment from landlords; overcrowded housing;​​living in poor housing and neighborhood conditions; preserving housing at all affordability level​s​​,prioritizing funding for rehabilitation and repair of existing housing stock; creating greater alignment and coordination between local government, health providers, and community-based organizations to address gaps in data. Shelterforce, an independent nonprofit publication ​that​​and sometimes challenges those in the community development field, offers a number of ​solutions​aimed at preventing gentrification. In ​a story​​​titled, ‘7 Policies that Could Prevent Gentrification,’ solutions include: aggressively building middle-income housing; reducing or freezing property taxes to protect long-time residents; and prohibiting large-scale luxury development in at-risk neighborhoods. Other solutions are enacting and strengthening rent control laws and developing Community Land Trusts. Those involved with or tracking gentrification​assert that community land trusts (CLTs) are a critical element in the palette of options available for cities seeking neighborhood stability through affordable housing. They​​​say​​obtaining public land for a land trust​is a way to address issues of environmental justice and displacement by creating open spaces, community gardens and much-needed affordable housing. While Moulden and David Bowers, a longtime housing advocate, said CLTs are viable and necessary solutions to counter gentrification. Bowers, who has been working with government officials, foundations, developers and others for more than a decade said, he has seen some promising projects from philanthropic organizations but he still doesn’t see the political will needed by elected officials to confront and significantly address the myriad problems gentrification has wrought. In his many conversations and interactions with government officials, Bowers said, the type of movement to effect real change has been absent. But Bowers said there is a significant movement, where people who had not been involved before have stepped up. He cited the case of Kaiser Permanente whose officials recently announced plans to invest $200 million to develop affordable housing nationwide.